Before you book a trip on Douce France -- or any ship on the Strasbourg-based CroisiEurope cruise line, for that matter – you must ask yourself a few questions: Are you open to new foods and set menus? Do you enjoy being around people who are a different nationality from you? Are you OK being in an environment where English isn't the main language? If you can wholeheartedly answer "yes" to these stipulations, then you'll be right at home on Douce France. The vessel, which originally started sailing in 1997, was completely rebuilt in 2017 as one of CroisiEurope's "5 anchor" premium ships. The rebuild brought the passenger load down to 107 from 160 and completely revamped all of the cabins and public spaces. The result is a spacious ship that's remarkably clean and modern, with a youthful color palette that belies the typical passenger (which remains baby boomer and up). Even the lesser-priced Main Deck cabins are pleasant, with stark white walls, lots of storage space and full picture windows that partially open for fresh air. The ship also has a handful of solo cabins. The largest European river cruise line, CroisiEurope has made a push to expand its offerings to English-speakers around the world, as well as North America. In the service department, the Douce France staff excelled in making the eight American passengers on our Rhine and Moselle cruise feel comfortable and informed. Announcements and activities were in both English and French; a designated entertainment guide gave us English briefings and bar staff remembered our language preferences. Our fellow passengers, too, were a fun lot, with many attempting to communicate despite the obvious language barriers. We spent an evening in a Rudesheim beer hall with French shipmates, locking arms and singing, even if we could only speak a few words of common language (German in this case). We witnessed some of our fellow Americans conversing with the French about the scenery, as well as the more delicate issues of politics. And, it turns out, everyone knows the words to YMCA. Perhaps because so many passengers are not traveling long distances to board the ship, Douce France has a wonderfully casual air. Take an excursion (or not); stay out late (or not); take part in the "aperitif games" (or not) -- the staff takes it all in stride, with a laugh and no judgment. While our designated English guide did make a point of checking in with us, the atmosphere was much more laid-back than the go-go-go feel you experience on most river cruise lines. Travelers who are taking the cruise as part of a longer European trip will appreciate the downtime. Type A personalities who want minute-by-minute instruction will not. That being said, our fellow Americans on Douce France had no problem with the meals as offered. All were on their first river cruise and most were doing the sailing as part of a longer European trip. CroisiEurope does offer some of river cruising's most varied itineraries, with a wide range of rivers and cruise lengths, including three- and four-day cruises. For these travelers, a four-day "teaser" cruise on Douce France, where they didn't have to navigate foreign language menus or make any decisions about what to eat, proved to be perfect. 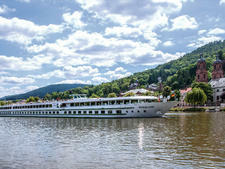 Those who are planning their river cruise as the main European event, though, might have different expectations. All in all, we found Douce France an extremely pleasant experience. Based on the rebuild, it seems like CroisiEurope is already creating ships that can appeal to an international audience, and we'd recommend a "5 anchor" ship like Douce France to any English speakers who can deal with the line's meal policies. As part of an international line, Douce France's passenger makeup can vary greatly, depending on itinerary and season. No matter what time of year, expect to sail with a lot of French passengers. Our sailing had eight Americans; the hotel manager tells us that there can be as many as a dozen English speakers from various countries or as few as two. Other nationalities might be Spanish, German, Italian, Belgian, Argentinian or even Norwegian. Announcements, programs and shore excursions are offered in French, English and whatever other nationality might be onboard. Although nationalities may vary, the age range is the same: baby boomers and older. CroisiEurope is a great value, with all beverages included (save premium alcoholic drinks), Wi-Fi, transfers to the ship and a daily excursion. The included excursions are considered the Classic package, and are usually a walking tour or visit to a museum or something similar. Alternately, you can pay extra for the Discovery excursion package, featuring wine tastings, bike tours or hikes. (If you see a Discovery excursion you like, you may or may not be able to buy it individually once you are on the cruise, depending on availability. The cruise line would rather that you buy your excursion package when you book.) Gratuities are not expected, although you can leave one at your discretion. The currency onboard is the euro.